Sometimes it’s the simple things that are the source of breakthroughs. For example: The words we use to describe our products are often far more powerful than we think. They actually position our products in the mind of the customer. A single word or phrase or name change can cause a customer to see your product in an entirely different light. We worked with a client who provided a program for children with learning disabilities to private schools. The program created impact results. It often raised a child’s reading level by 1 or 2 grades in only 4- 6 months. The administrators had a perception problem. Very bright children often had learning disabilities that kept them struggling just to stay at a C-level. These disabilities were covered up by the student?s intelligence, creativity and verbal skills. Instantly her mind went to teachers coming in and asking for advice on how to handle Johnny, Suzy and Brad who were bright but were doing poorly. Her mind also flashed on different parents pleading with her for advice on what to do about their child who was bright, but struggling for hours every night to get through homework. The problem was that those problems where never recognized as stemming from underlying ‘learning disabilities”. Once the company changed their marketing, sales approach and literature to feature “Hope for the Struggling Student” sales immediately doubled. Administrators, teachers and parents all became instantly receptive once the problem was phrased in their terminology. For a moment, forget everything you know about your product. Ask what the underlying problem is that it solves for your customers. Now ask THEM how they talk about that problem – what language they use to describe the problem. 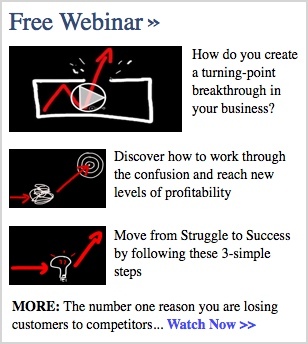 You may just be a few simple questions away from a business growth breakthrough.